You can use an NSG to control traffic to one or more virtual machines (VMs), role instances, network adapters (NICs), or subnets in your virtual network. An NSG contains access control rules that allow or deny traffic based on traffic direction, protocol, source address and port, and destination address and port. The rules of an NSG can be changed at any time, and changes are applied to all associated instances. For more information about NSGs, visit what is an NSG. Before you work with Azure resources, it's important to understand that Azure currently has two deployment models: Azure Resource Manager and classic. 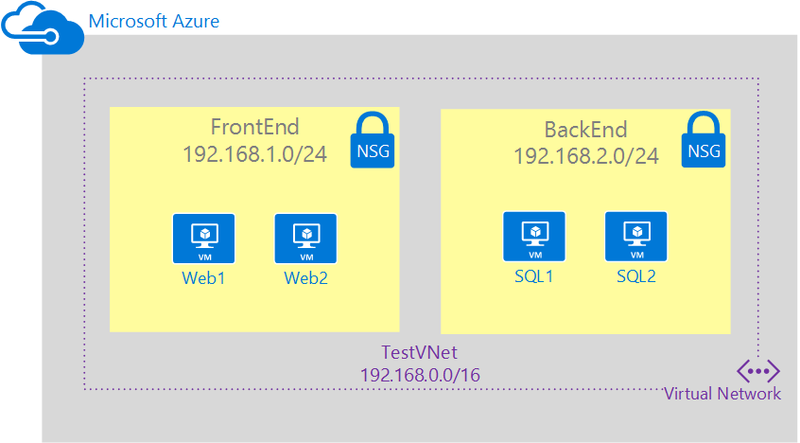 Make sure you understand deployment models and tools before you work with any Azure resource. You can view the documentation for different tools by clicking the tabs at the top of this article. This article covers the classic deployment model. You can also create NSGs in the Resource Manager deployment model. rdp-rule. Allows RDP traffic to the FrontEnd subnet. web-rule. Allows HTTP traffic to the FrontEnd subnet. sql-rule. Allows SQL traffic only from the FrontEnd subnet. web-rule. Denies all internet bound traffic from the BackEnd subnet. The combination of these rules create a DMZ-like scenario, where the back-end subnet can only receive incoming traffic for SQL from the front-end subnet, and has no access to the Internet, while the front-end subnet can communicate with the Internet, and receive incoming HTTP requests only. The sample PowerShell commands below expect a simple environment already created based on the scenario above. If you want to run the commands as they are displayed in this document, first build the test environment by creating a VNet. If you have never used Azure PowerShell, see How to Install and Configure Azure PowerShell. -Label "Front end subnet NSG"
-Label "Back end subnet NSG"